Another verdict by a literary critic in the newspaper of Prince Khalid Bin Sultan: Saudi ambassador in Lebanon is the best poet since Shakespeare and Mutanabbi. "In fact, the status of religious freedom in Iraq is in some ways worse today than it was under Saddam Hussein, according to independent analyses of the State Department's religious freedom reports." "Palestinians who approach Gaza fence will be shot, says IDF"
This is hilarious. The director of Al-Arabiya TV (owned by King Fahd's son-in-law), writing in Ash-Sharq Al-Awsat (owned by King Fahd's brother) calls Mugabe "a dictator." Certainly, there is more religious and political oppression in Saudi Arabia than in Zimbabwe. In Zimbabwe there are irregularities in elections; in Saudi Arabia THERE ARE NO ELECTIONS. Another armed robbery of a Syrian in Lebanon. "Will you be boycotting Zimbabwean goods?" No, but I am considering a boycott of British goods. "Iraqi government officials on Sunday criticized the American military for two recent attacks in which soldiers killed people who the government said were civilians." It is funny when Saudi media think that they can just replicate the cliches of Western media. Saudi media have been complaining about the "unfair" elections in Zimbabwe. I am waiting for the oxygen masks to come down any minute now. "A group of American advisers led by a small State Department team played an integral part in drawing up contracts between the Iraqi government and five major Western oil companies to develop some of the largest fields in Iraq, American officials say. The disclosure, coming on the eve of the contracts’ announcement, is the first confirmation of direct involvement by the Bush administration in deals to open Iraq’s oil to commercial development and is likely to stoke criticism. In their role as advisers to the Iraqi Oil Ministry, American government lawyers and private-sector consultants provided template contracts and detailed suggestions on drafting the contracts, advisers and a senior State Department official said."" Syrians, riding a bus with a Syrian license plate, were robbed at gun point in Lebanon. So I am hearing that the Syrian Ba`th party is going to unite with the Saddam Ba`th party of Iraq. Oh, yeah. This is as exciting as when the Saudi dynasty made up with the Qatari dynasty. Since the inception of Zionism, there has been a very annoying trend: when Zionist media try to tell us what the Palestinians are thinking. Usually, the Palestinians are thinking the opposite of what the Zionist media attribute to them. As`ad--not me--took this picture at the Gay Pride Parade in Toronto. He wrote me this: "see the photo of this Saudi dude with the poster, he was among Ryerson Students group, the poster was talking about Saudi repression of Gays, I was running around last minute with my phone to get a better picture but I couldn't, it was too busy." "Bernstein made an extremely odd comparison between American high school basketball players and Palestinian suicide bombers." And then some outfit called National Arab American Journalist Association came to her rescue by saying: "ESPN and Dr. Bonnie Bernstein issued a genuine apology" when no real apology was offered. (thanks Aliyar). On the front page of Hariri rag, Al-Mustaqbal, there is this headline: "White Hands Especially toward Lebanon and Palestine: Three years of accomplishments [for] the Servitor of the Two Holy Sites". There is an on-going bid. The Lebanese Internal Security Forces are looking for...musical instruments. Please help. Given the security situation in Lebanon, drums and triangles could really reduce the tensions. "The number of civilians killed in fighting between insurgents and security forces in Afghanistan has soared by two-thirds in the first half of this year, to almost 700 people, a senior U.N. official said Sunday." Now "security forces in Afghanistan can't possibly be referring to U.S. occupation troops, can it? LBC-TV had a show on U.S. policies in the Middle East. Shadha `Amr invited an Arabic speaking diplomat from the State Department to meet with a group of Arab students. The host wanted so bad that students would praise the U.S., but to no avail. She asked an Iraqi and a Kuwaiti in the audience, hoping that they would praise Bush. When they clearly did not, and criticized Bush's wars and policies, she kept going around until she found a Lebanese dude who came to the rescue and urged the Iraqis to give Bush's war a chance. And when a young student went on to rail against U.S. wars and occupation and U.S. support for Arab dictatorships, the host was visibly displeased with her. She interrupted her to ask: What about Iran? And then the host turned to a guest from Egypt, hoping that she would get a different message. She prefaced her question by saying that "Egypt had signed a peace treaty with Israel"...and the student interrupted her by saying: "unfortunately." The host clearly displeased asked: why unfortunately? 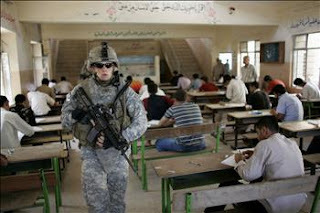 The student went on the criticize U.S. and Israel and the tyranny of Mubarak regime. The host, again, turned to another Egyptian student asking: do you agree with the other Egyptian student? The student agreed. Next time LBC-TV should invite MEMRI guests. I am sure they would not disappoint LBC-TV or U.S. administration. But the Lebanese student, Carol Kirbaj, was the star of the program. She provided the most devastating critique of U.S. economic and political programs in the region. She gave a political economy critique and then said that his U.S. discourse on democracy "provokes" her. She even slipped a critique of Saudi Arabia. If somebody in Lebanon knows Carol Kirbaj, please send her my regards. PS This show was quite interesting. And although the students were clearly screened, and they were very well-behaved and polite, but LBC-TV could not produce the agreeable Arabs that they wanted, with the exception of that Lebanese student (probably Lebanese Forces supporter). Even the Saudi and Kuwait students disappointed the host and her American guest. New TV aired a revealing report on the Hariri support for Salafis in Tripoli. "Do you consider yourself enlightened? Someone who goes around saying, “I’m enlightened,” is almost categorically not." "It has become increasingly hard for opposition leaders to campaign normally." Oh, yeah? Unlike how it is in Jordan, Morocco, Tunisia, Libya, Egypt, UAE, Saudi Arabia, Qatar, Bahrain, and Iraq. How awful. This is Zionism: "On Saturday afternoon, Israeli military forces attacked the funeral of 17-year-old Muhammad Anwar 'Alami, who was shot and killed by Israeli forces on Friday night. Several of the mourners were injured." I swear: I was reading the issues of An-Nahar from 1947 (to see the coverage of the Palestinian question), and I ran across an official statement by the Lebanese Ministry of Health in which it said that the Lebanese government has large quantities of a cure for cancer (called ACF) and that they are available for the people of Lebanon. I found on January 7th, 1967 issue of An-Nahar that the Phalanges Party submitted a petition to the Lebanese government questioning the benefits of Arab boycott of Israel. Among his hobbies are: "Environmental concern" and "hunting." Cutting edge journalism in the newspaper of Hassan Fattah--on behalf of UAE's ruling dynasties. Here is a front page headline: "UAE is secure and stable, says Sheikh Khalifa." Where are the journalism awards to be sent to Fattah NOW? Egypt liberal thinker, Jamal Al-Banna wrote a courageous book on women in Islam. 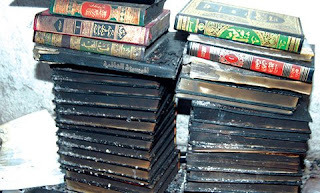 The book burning fanatics of Al-Azhar raised a hue and cry and got the Mubarak tyranny to ban the book. Not a single word about this in the Arabic press, or even in the Western press. The Cairo correspondent of New TV aired a great report on the case. But the reason why Western media are not championing Al-Banna is because he--unlike other Arab liberals--is anti-Israel and critical of U.S. policies and wars in the Middle East. This is Zionism: "The Israeli Information Center for Human Rights in the Occupied Territories (B’Tselem) issued a report stating that an Israeli soldier assaulted one of its coordinators while filming Israeli settlers abusing Palestinian shepherds in the southern West Bank city of Hebron." "Outraged Iraqi officials demanded an investigation into an early morning U.S. military raid Friday near the birthplace of Prime Minister Nouri al Maliki, saying the operation violated the terms of the handover of Karbala province to Iraqi security forces." Let me save you time and effort. U.S. military investigation will reveal that U.S. forces were within their right. Goodnight. Guess who has just joined the Axis of Bush? Prince Salman of Riyadh said that the kingdom will continue to serve as "a constant course of moderation." To illustrate his point, he ordered 4 extra beheadings in downtown Riyadh. Samir `Atallah (the one who writes daily tributes to Arab oil princes, shaykhs, and sultans), interviews Shaykh Khalifah bin Zayid of UAE. Shaykh bin Zayid describes Lebanon as a "civilizational lighthouse, and a warm lap" for Arabs. Nazi fans in Beirut. Karim sent me this from Lebanon--I use with this permission: "sorry the picture isn't better. 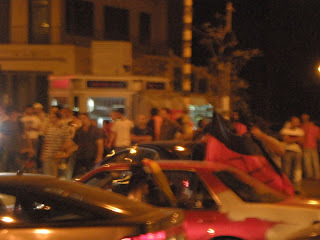 after the Semifinal Germany vs Turkey on Sassine in Ashrafieh. After asking him what he really was hoping to say with this the drivers final answer was: "I love Hitler", his girlfriend was visble emberassed :). A week earlier we were watching the quarterfinals Germany vs Portugal, when durign the opening ceremony they played the German athem a bunch of guys stood up right hand raised Nuremberg 1934 style. Most people here don't seem to care too much. even though quite sad, i thought you could find this amusing." Sami Amin Gemayyel. This is highly comedic. 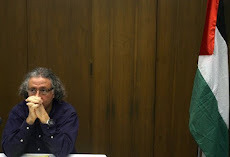 The repetition of the fascist experience of Bashir Gemayyel has been a farce thus far. This is Amin Gemayyel's son, Sami. He is warning those who are "messing" with the Phalanges. He said that those who are messing with the Phalanges don't know who they are messing with. Oh, yeah. He ads that "they" have been "resisting" for 1500 years in defense of "liberty, faith, civilization, and doctrine." After he finished his fiery speech, his father Amin asked him to brush his teeth and go to bed. When you read Ajami, you feel that you are reading European travel books in the holy land from the 18th century. "The Shiites are known for a cardinal doctrine of their practice taqiyya (dissimulation)". Like the U.S. administration does not practice dissimulation? My article in Al-Akhbar: "Between Haykal and his critics". The New York Times: "when television cameras captured a startling image of Mr. Mugabe holding hands with the smiling South African president, Thabo Mbeki, a professed champion of African democracy." Angry Arab Times: when television cameras captured a startling image of King `Abdullah holding hands with the smiling American president, George W. Bush, a professed champion of global democracy. I am not making this up. Raghidah Dirgham criticizes oppression of women in Iran; but she wrote this in the newspaper of Prince Khalid Bin Sultan. "A millionaire who inflicted years of abuse on two Indonesian housekeepers held as virtual slaves in her Long Island mansion was sentenced Thursday to 11 years in prison." A Lebanese leftist critique of Hasan Nasrallah. "A Palestinian survey shows that more than half of the families in the West Bank and Gaza Strip are living in poverty. The survey was conducted by the Palestinian bureau of statistics. It says 80% of the families in the Gaza Strip and 478% of families in the West Bank are living under the poverty line. That line is defined as a monthly income of $712 for a family of six." I received this message: "Hey angryarab! We announce another short film from Nahr al-Bared Refugee Camp in North Lebanon. The first few hundred Palestinian families were allowed to return to their destroyed or damaged homes at the outskirts of Nahr al-Bared Camp in winter 2007/08. They faced a very difficult situation. Many of them lost their homes and most of their property was either destroyed or stolen. This short video documents the refugee's experiences once they returned to their camp and their efforts to deal with their new reality. For security reasons, only an anonymized version of the film is published. It can be downloaded/watched at"
By the playbook of `Arafat. Hamas threatens to punish violators of its "calming down" with the Israeli occupation. A Syrian was robbed and beaten in Lebanon. 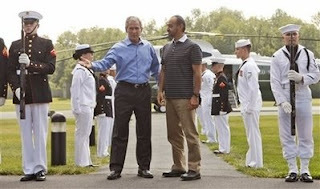 "President Bush, left, with Crown Prince of Abu Dhabi, Sheik Mohammed bin Zayed Al Nahyan, right, during an arrival at Camp David, Thursday, June 26, 2008." Prince Salman bin `Abdul-`Aziz is visiting Sweden. Saudi media are insisting that the visit aims at strengthening relations between the two countries. I am sure. He visited the Nobel museum and said that Arab contributions should not be ignored by the Nobel committee. He also asked whether there is a special Nobel prize for beheadings: he argued that his family deserves it. 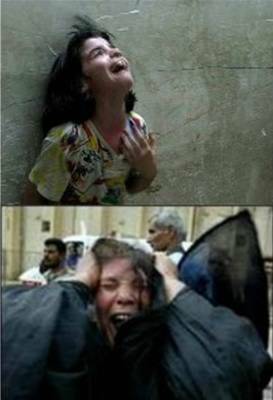 "Nine Iraqi civilians were killed Wednesday in two armed clashes involving U.S. soldiers, local authorities reported. The military said U.S. soldiers were fired upon first in both incidents." On the first day of the war in 1967, the Saudi government announced that Prince `Abdullah, in his capacity as commander of the National Guard, has placed them on high alert and told them to be ready to join the battle "at any point." I saw that in an issue of An-Nahar. Saudi Arabia, hoping to impress the U.S., is highlighting the news of the recent "uncovering" of Al-Qa`idah cells in the kingdom of oppression. The mouthpiece of Prince Salman (Ash-Sharq Al-Awsat) published this picture on its front page (on the internet version) and said that the books were confiscated in the recent raid on apartments. Look at the tiles of those "dangerous" books. One reads "international encyclopedia." Another one seems to be a volume of the classic dictionary Lisan Al-`Arab. So Saudi Arabia receives criticisms in U.S. congress and media over oil prices, and Saudi Arabia immediately and conveniently responds by announcing the arrests of hundreds of Al-Qa`idah members in Saudi Arabia. One of them was found in the private quarters of the king. "Twenty-one percent of self-identified atheists said they believed in God. Ten percent believe in hell." "...and humiliation, I believe, is the single-most underestimated force in international relations, especially in the Middle East." OK, while you are at it, tell me. How was that pie in your face? I would rather hear about that than about your silly and vapid "theories" about world affairs. "A new poll of citizens’ attitudes about torture in 19 nations finds Americans among the most accepting of the practice. Although a slight majority say torture should be universally prohibited, 44 percent think torture of terrorist suspects should be allowed, and more than one in 10 think torture should generally be allowed." "A doctor named John Drew Laurusonis and two of his assistants in Georgia have been accused of locking a woman in an examination room "when concerns arose about her ability to pay the bill." The three were indicted last week on charges of false imprisonment for the October 4th, 2007 incident." Today, I heard the words of Iraqi puppet president, Jalal Talabani, in the Oval Office. He hailed Bush as "the liberator of Iraq" and as a "friend" of the Iraqi people. Lest you get excited, remember that this man showered similar words of praise on Soviet leaders and even on Saddam Husayn. PS And the item goes on to say: "Prejudice against homosexuals remains deeply rooted in Cuban society, as in much of Latin America.." Oh, yeah: unlike the U.S.
"Over 40 Asian workers including a number of Indians, who claimed they were not paid wages for seven months, remain stranded in Saudi Arabia even as authorities asked local police in Riyadh to expedite their cases. The hospital workers are demanding that they be paid their dues and provided plane tickets to go back home in accordance with the law." The lies of Prince Turki Al-Faysal. So this Prince was on Al-Arabiya TV (the mouthpiece of King Fahd's brother-in-law) talking about his father. He talked about the (silly and incomplete) oil embargo of 1973. He said that his father would only take decisions after careful study. He said that his father refused to implement an oil embargo in 1967 although his own oil minister agreed in an Arab meeting in Baghdad at the time to enact an embargo. But the lies of Turki (the former close friend and patron of Bin Laden) were all too clear to miss. The (false) announcement of a Saudi oil embargo took place much earlier than that meeting in Baghdad. An-Nahar's issue of June 8, 1967 reported that Riyadh Radio reported that the Saudi council of minister met and agreed to end "immediately" all oil sales to countries "that help Israel." That was a lie of course. "Three years after a former general was almost arrested in England for alleged war crimes, the IDF has returned to sending senior officers to England for military studies, The Jerusalem Post has learned." No, but I support military intervention in UK. "Over all, the report says, the American plan for a stable Iraq lacks a strategic framework that meshes with the administration’s goals, is falling out of touch with the realities on the ground and contains serious flaws in its operational guidelines." Yesterday, Al-Arabiya TV (the mouthpiece of King Fahd's brother-in-law) kept repeating that "coalition forces" in Afghanistan have killed 55 Taliban fighters. I am sure that Al-Arabiyya examined every dead body and verified that they were Taliban fighters before they aired the report. "The sense of drift is the subject of almost every columnist in the English-language press in Pakistan..." But Carlotta: can you please tell us what the non-English language press is saying in Pakistan? Thanks. "“There is this excitement that if he can win, they can win, too.”" Oh, no, James Zogby. The only thing that excites you is the UAE's ruling dynasties. Saudi media now contains praise of Qatar. Only a few months ago, the same columnists who are now writing praise were attacking Qatar for everything under the skies. Salim Al-Huss (former prime minister) blasts all sides in Lebanon (government and opposition) for their sectarianism. He rightly does not spare any of them. "Under the title of "military exports and aid" the ministry allows former Mossad Shabak, Israel Defense Forces and Israel Police officers to sell their security expertise. This knowledge is often translated into weapons sales, training for VIP bodyguards, establishment of security services and sales of intelligence-gathering equipment to ruthless and corrupt dictators in Angola, the Republic of the Congo and the Democratic Republic of the Congo and other African nations." Guess who speaks for the Arab masses now? John Bolton: "The Arab world would be "pleased" by Israeli strikes against Iranian nuclear facilities." Lebanese playwright (and An-Nahar columnist who said during the destruction of the Nahr Al-Barid refugee camp that there are no Palestinian civilians), Raymond Jbarah, responds to my criticisms of him. He calls me a barking dog that needs to be tied. This is the level of discourse in An-Nahar. Somebody needs to explain this to me: why is this getting all this (deserved) attention, when Husni Mubarak did the same to his opponent, Anwar Nur, who remains in jail for daring to run against Mubarak in the last election? Ziad sent me this: "There are two factual errors in your comments about the lebanese priest. First he was beatified not canonized. Canonization is the next step (the Vatican eagerly awaits your testimony of how he cured your potato which had suffered severe cuts and 2nd degree burns after being sliced and dropped in a deep fryer :-) and secondly his name is Haddad not Kabbushi. He was a Cappuchin priest hence Al-Kabbushi. See link below." "Iran banned a daily newspaper for publishing articles critical of President Mahmoud Ahmadinejad's economic policies, Iran's English-language Press TV reported on Sunday." "Two years later, Harb was named the first news director for the Alhurra television network. He rented the abandoned studios of a former local television station in Virginia and spruced up the sets. He then filled the newsroom largely with inexperienced Christian Lebanese reporters hired in his native Beirut and signed lucrative sole-source contracts with friends who ran advertising agencies, production companies and warehouses across the Middle East. Some low-level staff members were highly paid, including a hairdresser from Lebanon who coiffed the anchors for $100,000 a year. New hires were promised an American Green Card if they lasted two years with the network. Harb did not respond to e-mail requests for comment. Harb told Congress the network had achieved soaring viewership and popularity in the Middle East. He dismissed polls that showed Alhurra with no more than 2 percent of the Middle East audience share and blamed complaints about the content on his initial budget, which he believed was too small to allow Alhurra to compete with media giants such as Al Jazeera." "According to data compiled by Andrew Tyndall, a television consultant who monitors the three network evening newscasts, coverage of Iraq has been “massively scaled back this year.” Almost halfway into 2008, the three newscasts have shown 181 weekday minutes of Iraq coverage, compared with 1,157 minutes for all of 2007. The “CBS Evening News” has devoted the fewest minutes to Iraq, 51, versus 55 minutes on ABC’s “World News” and 74 minutes on “NBC Nightly News.” (The average evening newscast is 22 minutes long.)" It is a Bush Doctrine indeed: ""We chose 35 companies of international standard, according to their finances, environment and experience, and we granted them permission to extract oil," oil ministry spokesman Asim Jihad told AFP. "raq will award contracts to 41 foreign oil firms in a bid to boost production that could give multinationals a potentially lucrative foothold in huge but underdeveloped oil fields, an official said on Sunday." One of the things that I really like about the American people is that they really are philanthropic: "Americans donated $306 billion to charities in 2007, as U.S. philanthropic giving rose to a record level despite a downturn in the national economy, a survey being released today has found." (And most charitable are the middle--not upper--classes). Some Saudi dissidents who are opposed to the House of Saud and their rule ask me to refrain from referring to Saudi Arabia by its name. They suggest that I use Arabia instead. Not a bad idea. A good summary of the acute sectarian discourse of Sunni, Shi`ite, and Christian clerics in Lebanonesia. The newly canonized Lebanese saint, Father Ya`qub Al-Kabbushi, was credited with the "miracle" of curing a woman from cancer--and notice here this Lebanese propensity to either "discover" cures for cancer or to fend off cancer through religious miracles/quackery. But if he was able to cure diseases, why is he also credited for founding a hospital? Why not cure them all with one stroke. Inquiring minds want to know. I want to know, damn it. "In search of Red Rosa" by comrade Khalid. "Commentator Amir Rappaport, writing in Israel's Maariv daily, said it was likely the Pentagon leak was an attempt "to deter Iran and increase pressure on it to cooperate" with international nuclear watchdogs." Wow. Look at this. Now I know why U.S. media like to quote Israeli experts. I mean, are you aware how much brain power is required to come up with such brilliant insight? Who could arrive at such conclusion on his/her own? And do you notice that you can read lengthy articles in U.S. media about the prospects of Iranian nuclear capabilities without ONE WORD about the current Israeli nuclear arsenal? I just heard a guest (a certain Yusri Husayn) on Al-Arabiya TV refer to "the democratically-elected [Hamid] Karzai government." Yesterday, out of the blue I received a phone call from Lebanese actor, Ahmad Az-Zayn. Ahmad Az-Zayn did comedic roles with Shushu, and later had many TV and movie roles. I liked him most in the TV serials As-Sanawat Ad-Da'i`ah, which was brilliantly directed by Samir Nasri (the later movie critic for An-Nahar). He said some nice things to me about my articles in Al-Akhbar and asked me to watch his new series on NBN-TV. I did watch two episodes of the series: they are politically strong: about the neglect of the poor, and about the way Hariri family corrupted Lebanon and its press. But I feel that the series need more dramatic developments otherwise it would be too preachy. Iyad `Allawi (former Iraqi puppet prime minister/car bomber/embezzler-in-Yemen/Saddam's henchman) spends his time between London and Beirut. Al-Afkar magazine is reporting that he is opposed to the U.S. security for occupation agreement. But `Allawi always sounds like an anti-American Ba`thist when he travels in the Middle East, until he is ordered by the Americans to go to Iraq to stand for puppet election. U.S. occupation forces are holding 21,400 Iraqi prisoners in Baghdad and Basrah. But all prisoners are grateful that the U.S. "liberated" Iraq. Of course. (Notice that this Saudi mouthpiece of Prince Salman provides the sectarian breakdown of the prisoners (80% Sunnis). This is Zionism: ""The idea that Islam can be reformed is a fallacy," he scoffs. "It's like saying we can reform Nazism and it will be a wonderful party."?" Can you imagine the (justified) uproar if an Arabic newspaper printed something similar to this article on Judaism? 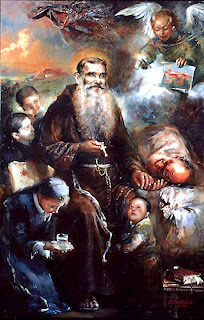 Lebanon is celebrating the canonization of a saint today. The dude lived in the 20th century and, yes, performed tons of miracles. This official poster on the occasion sums it all: it is kitsch, vulgar, ugly, tacky, sexist (look at the only woman in the picture: she is fetching a glass of water to Father Ya`qub and kneeling before him) and unimaginative. Pretty much what Lebanonese culture is all about. 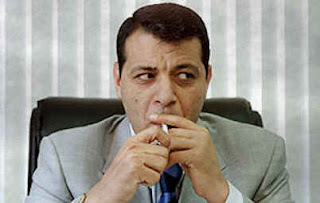 Dahlan, o Dahlan: "The Palestinian Preventive Security forces are launching a campaign in the West Bank city of Bethlehem to crack down on unlicensed and sometimes bothersome street vendors." "The Public Committee Against Torture in Israel (PCATI) released its semi-annual report Sunday, detailing evidence of abuse inflicted on Palestinian detainees while being taken into custody by Israeli soldiers. The report, dubbed "Unlawful in reality – soldiers' abuse of Palestinian detainees," unveils a series of cases in which Palestinians who were arrested and handcuffed were abused by IDF soldiers while being detained or transported to a holding facility, to the extent that some of them needed medical attention."" "The 2007 poll highlighted the extent to which Sunni Muslims in Lebanon have positive opinions of the United States (52% favorable, 47% unfavorable), although Lebanese Shia hold distinctly negative views (7% favorable, 92% unfavorable)." 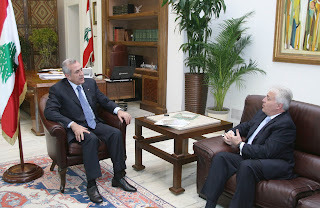 Yes, but this is deceptive in itself because Lebanese Sunnis largely sympathize with U.S. policies in Lebanon (which support the largest Sunni political forces, Hariri Inc), but they would express unfavorable views if the question made a distinction between U.S. policies in Lebanon versus U.S. policies in Palestine, for example. Lebanon is now popping out saints at the rate of one a month. Would you not want to join the Vatican (scientific, I am sure) committee that investigates the miracles? For hard hitting journalism, I turn to Hassan Fattah's newspaper (on behalf of Dubai's ruling dynasty): "UAE education well placed to develop knowledge economy." So according to a new public opinion survey in Lebanon, the number one Lebanese leader (ranked by respondents) is...NOBODY (27.1 %), followed by Hasan Nasrallah (12%), then Michel `Awn (11.3%), then Sa`d Hariri (9.7%), then Nabih Birri (10.2 %), then Michel Sulayman (9.4%). Samir Ja`ja` (Ga`ga` in Egyptian accent) received 3.2% while Walid Jumblat received 2.9%. "A student from the Od Yosef Hai Yeshiva built a crude rocket and fired it from a nearby hill at a Palestinian village in the West Bank, security officials said Friday. No one was wounded." I would not be surprised if the student is offered a chair in Middle East studies at a U.S. university very soon. Nicholas Kristof comes out with this theory: that Muhammad Dahlan and his gang are "are the best hope of both Israel and the Arab world." "The UN children's fund UNICEF has severed ties with an Israeli billionaire and financial backer due to his suspected involvement in building settlements in the West Bank, UNICEF said on Friday." Did you see the last episode of Gizelle Khuri's Bil `Arabi on Al-Arabiya TV? Did you see how she kept pressing her guests about the plight of Israeli occupation soldier, Shalit? Conspiracy? What conspiracy? When Kanan Makiy tries to sound deep: "A book’s beauty comes from personal opinion." Let me add this to his aphorisms: A potato's beauty comes from hurricanes. My article in Al-Akhbar: "Zionist Phoenicianism: Honoring Bishop Ignatius Mubarak." I will never again say that people of the Middle East have no confidence in Bush. Look NOW. From the U.S. Archives: "Arabic anti-Communist Pamphlet Program". (Note the help of "prominent" religious leaders). Al-Arabiya TV and even Al-Jazeera folks have become so chummy (this is the second time I use the word chummy in a month--and I never used it before, so please take note) with Israeli guests that I expect Al-Arabiya anchorpersons to start asking their Israeli guests to sit on their laps. Did you see that? The Arab American anti-Discrimination (but only against Arab royal families) Committee, known as ADC, saluted Obama for removing scarved Muslim women from his background. They urged him to further humiliate Muslims and Arabs but to show utmost respect for for Arab ruling dynasties. "The American delegate who is a senior advisor for Rice started the session with a long demo of how good the US is to women all over the world, conspicuously ignoring the middle East and North Africa region (MENA) which was the main focus of the meeting. Once she finished, most Arab delegates spoke (there were about 12 of us ) and we all pointed out that foreign occupation is the most critical problem that breeds poverty, humiliation and disease for women, and that putting an end to foreign occupation is the most valuable assistance that we can give to women all over the world." Yes, but please give me a break, Ms. Sha`ban. Saudi women suffer a lot and it is not from foreign occupation. I thought you needed three miracles? If that is the case, I am a candidate: I have two miracles under my belt already. "The next step, beatification, requires evidence of one miracle (except in the case of martyrs)." I should have a regular item titled "Poor Israel." This is the first in a series: ""They have been conducting some large scale exercises — they live in a tough neighborhood," one U.S. official said." As if the neighborhood has any resident more thuggish and violent than Israel itself. Flash. EU threatens Saudi Arabia, Egypt, Morocco, Jordan, UAE, Bahrain, and Tunisia with sanctions for their oppression.
" Secretary of State Condoleezza Rice on Thursday said the U.S. government played no role in securing the deals. She called the impending contracts a sign that security gains are attracting foreign investment in Iraq." "Israel is reportedly attempting to block a $400 million arms deal between the United States and Lebanon that would reportedly include hundreds of anti-tank missiles." This is Zionism: "Jerusalem officials to High Court: Gay parade desecrates holy city." But my favorite is this: "In a joint letter to the High Court, Mayor Uri Lupolianski and city manager Yair Ma'ayan wrote: "Past experience shows that the parade greatly offends, deliberately and unnecessarily, the feelings of Jews, Muslims and Christians, who view its sheer existence, and the blatant manner in which it takes place, as a desecration of the holy city and of the values with which they were raised."" Oh, yeah: the Israeli state has a long record of sensitivity to Muslims and Christians. Oh, yeah. Dahlan, o Dahlan: "In its own interests, Israel should lift the siege of Gaza." He basically is saying: To hell with the Palestinians. But it is nice to know that the Washington Times is hospitable to Dahlanists. "My husband likes to play PlaySation III all the time, but for Israel and the Israelis, he would do anything and everything." Michael Slackman of the New York Times overdoes it here: way overdoes it. I mean he admits toward the end that: " That Mr. Issa is a Christian is evidence that the use of inshallah is not just a phenomenon of Egypt’s Muslims." And of all the stories in Egypt (strikes, hunger, oppression, religious fanaticism and book burning at Al-Azhar), he could not find a more worthy story? I mean, I don't like religious lingo, and it irritates me how many times people here say "Bless you" for every damn sneeze. Would the New York Times devote a whole article to that? Also, there are new words that have made themselves into colloquial Egyptian that are not religious: like ladhiz (comparable to "cool" in English) but do they warrant an article? Also, why do Western reporters love to talk to Ali (not Aly) Salim? I mean, for his literary contributions? The man is known for writing a script for a silly and stupid play in the 1970s that can compare to the Police Academy movies in the 1980s. Certainly, it is not his literary contributions but his support (in English only, in Arabic he still says anti-Israeli and anti-Semitic things) for normalization with Israel when he speaks at the Washington Institute for Near East Policy). Also, there are Muslims who say "Insha'allah" when drinking or gambling: so the word pretty much lost its religious connotation. Did you just sneeze, Mr. Slackman? Because of you have, I have a bevy of Americans who want to tell you: BLESS YOU. Israeli propagandists can leak anything to the New York Times and they will guarantee to put it on the front page. It must be nice. Lessons on Lebanese history by comrade Rami. "Mahfouz wrote in a classical Arabic, which is comparable to Shakespearean English and doesn’t lend itself easily to translation..." What do I do with those in the West who write about Arab culture and language and who don't know what they are talking about? In fact, Mahfouz wrote in a language close to newspapers' Arabic. A call for the Arab religious establishments to end their burning of books and censoring of thought. "When he speaks publicly, Lt. Cmdr. William C. Kuebler, a military lawyer for a Guantánamo detainee, is careful to say his remarks do not reflect the views of the Pentagon. As if anybody would make that mistake. In his Navy blues, the youthful commander could pass for an eager cadet. But give him a minute on the subject of his client, a terrorism suspect named Omar Khadr, and he sounds like some 1960s radical lawyer, an apple-cheeked William Kunstler in uniform. The Bush administration’s war crimes system “is designed to get criminal convictions” with “no real evidence,” Commander Kuebler says. Or he lets fly that military prosecutors “launder evidence derived from torture.”""
Al-Arabiya TV started the newscast today by reporting on the "horror" and "terror" that residents of Israeli towns suffered from Hamas bombing. It almost added that constant Israeli bombings of Gaza was intended as a joke. MSNBC kept repeating yesterday that a rainbow appeared mysteriously (and miraculously) over Washington, DC just after the service for Tim Russert. They implied that their God was involved somehow. I am sure that their God, taking time from his busy schedule of judging peoples and casting them to his Rotisserie-of-humans hell, watches American cable news all the time. "Satloff is welcome to disagree with the analysis, but manufacturing a quote to make one's point has no place in a reasoned and scholarly discussion." To Arab and Muslim supporters of Obama: he does not want your support. He has made that clear. Please leave him alone. U.S. and Shi`ite Politics in Lebanon. 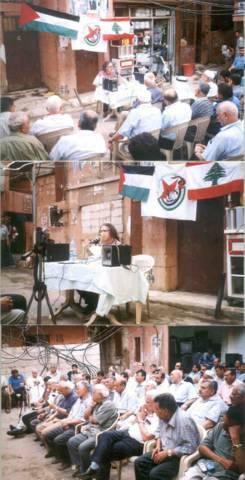 So you all must have heard about this incident with the U.S. embassy delegation in South Lebanon. Several remarks: notice that all Western news accounts referred to the protesters as "Hizbullah supporters". How did they know that? Did they interview them one-by-one? I saw the footage on Lebanese media and none referred to them as "Hizbullah supporters". The purpose behind the identification of the crowd as "Hizbullah supporters" is: 1) to delegitimize the protesters in Western eyes; 2) to pretend that protest against U.S. policies is confined to Hamas and Hizbullah in the Middle East region; 3) and to promote a distinction between the people of South Lebanon and Hizbullah when public opinion surveys and elections indicate that Amal-Hizbullah (and Amal is the very junior partner here) command the support of at least 95% of Shi`ites in Lebanon--whether you like it or not. The other thing that got my attention was this: U.S. efforts at promoting and cultivating Shi`ites alternatives to Hizbullah are rather comical. This is like the hosting of Ahmad Al-As`ad (representative of what remained of Al-As`ad feudal family, and who 25 years ago complained to me that his father (former speaker, Kamil Al-As`ad) spoiled his education because he never would make up his mind whether his son would become a "za`im" or not--the father and son are now on non-speaking terms) by the Foundation for the Defense of Democracies (which holds views to the right of Meir Kahane). But what was amusing is that Ms. Sison was visiting this `Abdullah Bitar (who belongs to Ahmad Al-As`ad's group which has a support among Shi`ites equals to much less than the margin of error of every poll on the subject), who after the flight of the delegation from his house earlier today made a statement to the LBC-TV. He said that he only meets with the Americans to pressure them to pressure "the Israeli enemy." It was not reported whether he chanted to the crowd that song by Sha`ban `Abdur-Rahim titled "I hate Israel." You read this story and learn of the brilliance of U.S. Middle East policy what you knew not before. "For the most extensive medical study of former US detainees published so far, Physicians for Human Rights had doctors and mental health professionals examine 11 former prisoners. The group alleges finding evidence of US torture and war crimes and accuses US military health professionals of allowing the abuse of detainees, denying them medical care and providing confidential medical information to interrogators that they then exploited."